Santonio Holmes, Mark Sanchez: The New York Jets are out-Lupica-ing Mike Lupica. The New York Jets are out-Lupica-ing Mike Lupica. 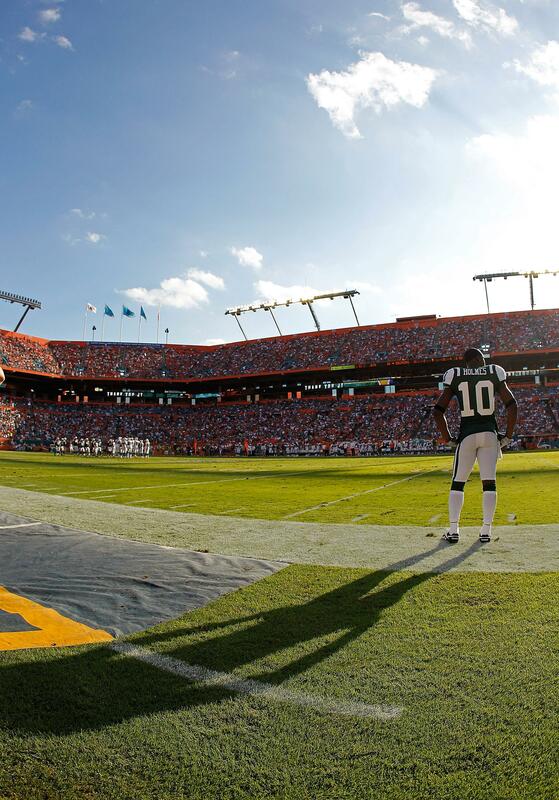 Santonio Holmes looks on during the Jets’ Week 17 game against the Miami Dolphins. Have you heard? The Jets’ locker room has a “corrupt mindset.” I know this because the team’s injured fourth-string quarterback said so. That’s Greg McElroy, talking to a Birmingham radio station on Wednesday. What kills me about that quote isn’t just the breathtaking presumptuousness of it—the fact that the guy holding the clipboard for the guy holding the clipboard for the guy holding the clipboard is raining judgment on the souls of his teammates. What kills me is that he sounds so much like, well, a pundit. Nate, you write a lot about the distorting influence of the media on the game itself. What’s happening here feels like the next step: Players have so internalized the stovepiped moralizing and ex post facto scapegoating of the press that they now inflict this stuff on each other. The locker room was “corrupt,” says one player. Santonio Holmes was a “cancer,” says another. He wasn’t enough of a “leader,” says yet another. You know who they all sound like? Mike Lupica, that’s who. I really don’t get all this caterwauling and garment-rending over a perfectly ordinary team like the Jets, anyway. This was a so-so bunch with a so-so-at-best quarterback that had the so-so year a lot of people figured they would have; if the ball bounces the other way a couple times, they go 10-6 and make the playoffs, and everyone calls it a nice season, and no one is delivering encyclicals on Birmingham radio. Do people really think this team is a leader and a couple trust-falls shy of greatness? The Jets are squarely in the NFL’s middle class. They have an excellent defense and a smart coach who knows how to use it, and they have way too many defects on the other side of the ball to even approach the Patriots’ or the Packers’ level. (And for the record, that cancerous wide receiver is better at his job than the quarterback he snubbed, Mark Sanchez.) That sort of team will go 8-8 from time to time; you don’t need any metaphysical explanations for that. And yet here we are, talking about “corrupt mindsets.” What Nate said about quarterbacks goes for the NFL as a whole. A sport dedicated to the proposition that anyone could go 8-8 in any given season has totally lost the capacity to deal with averageness.